Do you want to get more high quality leads? Do you want more sales and repeat customers? Do you want to dramatically increase your ROI? 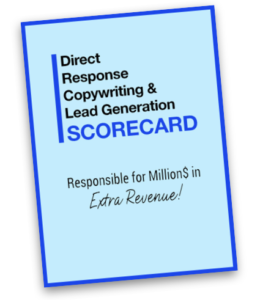 My powerful Lead Generation and Direct Response Copywriting Scorecard is proven to make all your marketing materials score BIG! This scorecard quickly highlights the strengths and weaknesses of your copy, so you’re putting out the most powerful copy possible. Just check the box and I’ll rush you your complimentary copy of this amazing sales tool. This scorecard has made millions in extra revenue for natural health marketers just like you. It has been used by leading companies like Sun Chlorella, Agora, Health Alert, Weiss Publishing, and New Market Health to skyrocket sales. And now it can be yours. Just fill out the form below. Your privacy is 100% guaranteed. Your information will not be sold or shared. Ask for my direct response copywriting scorecard. It’s responsible for millions in extra revenue. You should know that this document has been used for decades by the world’s top direct response marketers. And now it can be yours. I’ll tell you how I came by it later on. But for now, simply complete the form below. If it looks like I can help you bring in more leads and sales, I’ll promptly send you a copy. By way of introduction, my name is Jenny Hohmann, and I’m the one who can hep you boost those ROIs. So leave your information in the form below, and if it looks like I can help you, I’ll send you a copy of my direct response copywriting scorecard. This powerful selling tool can also be used to dramatically improve the effectiveness of your content creation, as well as your lead generation.